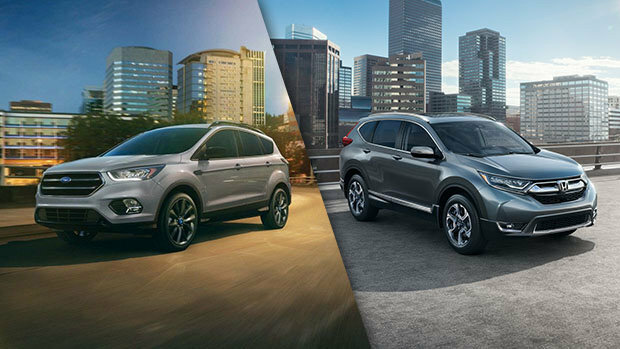 We propose to compare 2 SUVs: the 2018 Ford Escape and the 2018 Honda CR-V, to see and test drive at the Spinelli Honda dealership in Montreal. The 2018 Ford Escape is available with a 2.5-litre iVCT, 4-cylinder engine which develops 168 horsepower and a torque of 170 lb-ft. It is equipped with a 6-speed SelectShift automatic transmission, front-wheel drive and 17” steel rims. It provides a cargo space of 1,925.6 litres (68 cu.ft.) behind the first-row seats and 964 litres (34 cu.ft.) behind the 2nd row. The 2018 Honda CR-V presented by Spinelli Honda, the Honda dealership located in Montreal, close to Île Perrot and Vaudreuil and easily accessible via Highway 13 starting from Laval, is more capable than the 2018 Escape. Indeed, the 2018 CR-V is powered by a powerful 1.5-litre, 16-valve, Direct Injection, DOHC, turbocharged 4-cylinder engine that develops 190 horsepower and a torque of 179 lb-ft. With its volume of 2,999 litres, the interior is more spacious than that of the 2018 Escape, which only has 2,797.1 litres. The 2018 CR-V, to test drive at Spinelli Honda, located in Montreal and easily accessible via Highway 13 if you start from Laval, is fitted with the CVT gearbox. Just as the Ford Escape, it is compatible with Android Auto and Apple CarPlay. Even more, the 2018 CR-V enjoys the solid reputation of high-performance and reliability built up by Honda powertrains over the years. What is more, the 2018 CR-V, which you are invited to discover close to downtown Montreal at Spinelli Honda, offers a much bigger cargo capacity than the 2018 Escape. Indeed, its trunk area has a useful volume of 1,110 litres (39 cu.ft.) behind the rear seats when they are up and 2,146 litres (76 cu.ft.) once they are folded down. More comfortable, more powerful, with a more impressive loading capacity, the 2018 Honda CR-V, presented by Spinelli Honda close to Vaudreuil and Île Perrot, has better energy-efficiency than the 2018 Escape. The 2018 CR-V only consumes 8.4 L/100 km in the city and 7.0 L/100 km on the highway, while the 2018 Escape swallows 11.1 litres in the city and 8.1 L/100 km on the highway. With this massive fuel consumption, the 2018 Escape rejects 4,485 kg of greenhouse gas per year in the atmosphere, while the 2018 CR-V only emits 3,574 kg per year. Strategically located close to Highway 20, the Spinelli Honda dealership is easily accessible, either from Laval, Île Perrot, Vaudreuil or any neighborhood in the city of Montreal. Spinelli Honda presents the full range of Honda SUVs. By purchasing or leasing your 2018 CR-V, you will benefit from the advantages offered by Honda promotions and Honda financing plans.